NATHAN SANKEY BENEFIT A HUGE SUCCESS! Thank you so much to the more than three hundred people that came out to this important benefit event for young Nathan! The bands, organizers, food, beverages, and donations have made a huge difference for the Sankey family. We thank you, our friends and fans, for your continued support. 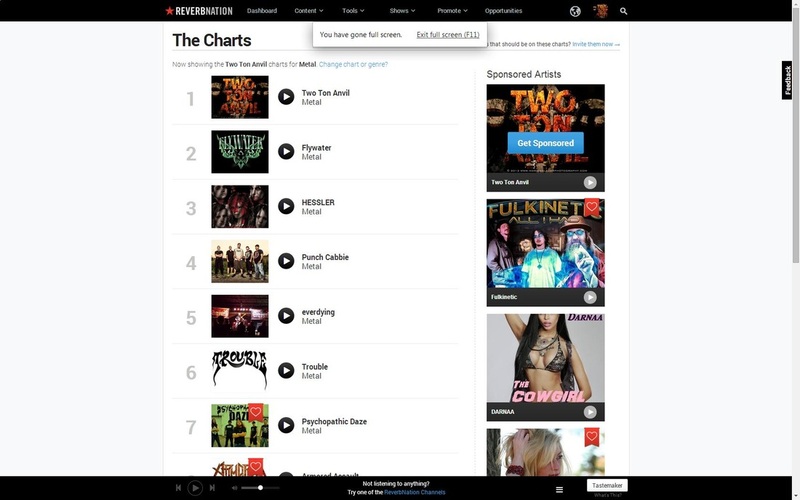 As seen on the photo below, we have reached the # 1 position on ReverbNation Metal charts for Chicago...AGAIN. While we have managed to stay in the top ten in a very competitive market. You can see the great bands up there with us & you have stayed with us and helped us stay at #1 for over a week now. Be certain everyone's gunning for us. As dedicated as we are to the band and what we do to keep it moving forward, none of this is possible without your support. So, once again we thank you and look forward to seeing you at a show very soon! Well Everyone, We Did it. We just Finalized our Deal with the MVD Entertainment Group and Dark Star Records. This is a Huge Deal for Us, and because our Foreign Distributors Planetworks work together with MVD we Now Have the World in our Hands. Also, with our Digital Distribution partners SONY MUSIC it Looks as though Today we are on Top of the World. Cheers Everyone! Check out photos from some recent shows this year. Thanks to Mario, our photographer from mariosalazarphotography.com for the GREAT shots!!! Check them out on this page right HERE. A reminder that our NEW VIDEO for the single BALLBREAKER hits the online airwaves tonight Sunday August 4th. Check the BLOG for details! I've just added a new BLOG entry with an update on our lineup changes, a NEW video which will becoming up very soon, and upcoming opportunities to catch-up with the band in one-way-or-another. Check it out HERE and hope you all continue to have a great summer. We were interviewed by Chicago's Rock while on-the-road as we performed at an outdoor music festival in the Kansas City, MO area some days ago. Check out the interview below, look out for us at a show or festival near you and most definitely, keep in touch! "Catch up with the Two Ton Anvil crew while on the road, where they give us an update on what's going with the band". TWO TON ANVIL IS ON THE RADIO. A call to the 'Two Ton Army', please request our single "BALLBREAKER" on Chicago's FM 95.1 WIIL Rock by calling (800) 223-9510 or texting 68255 and give us a vote for PUFF. Dark Star Records has released the sophomore album 'Coming Home' from TWO TON ANVIL. The album includes a slew of crushing singles such as Ballbreaker, Victory, Timebomb, Murder Cage, and also includes a remake of the popular single Synchronicity II by platinum selling artists The POLICE. Also, as a tribute to all the men and women in uniform that have helped protect The United States of America, the band has decided to pre-release a special limited edition autographed copy of the new 14 song CD Coming Home. The CDs are autographed by Reed McCallister, the lead vocalist and lead guitar player for the band, and are available for only $5.00. Click on the photo to the right to link directly to offer page. The band has a revamped line-up including Marcus Lee on drums. Shows are now being booked and added with plans of regional touring in the works! Our next show with the new lineup is in Madison WI at the "REGENT STREET RETREAT" July 27th - come on out and meet the band up close and personal! If you're fortunate enough to catch Two Ton Anvil's high energy show you'll want to keep coming back for more. Their first release has been selling really well throughout the US and especially good in the Midwest where the group has been focusing with the intention of spreading the Two Ton Anvil gosphel Nationwide and Worldwide. Click or pick up the bands debut and new Coming Home CDs if you haven't already! There's a like on the picture to the right and below this post! Thanks for visiting and don't forget to visit our other social media sites! SUMMER 2013 CONTEST WINNERS REVEALED. 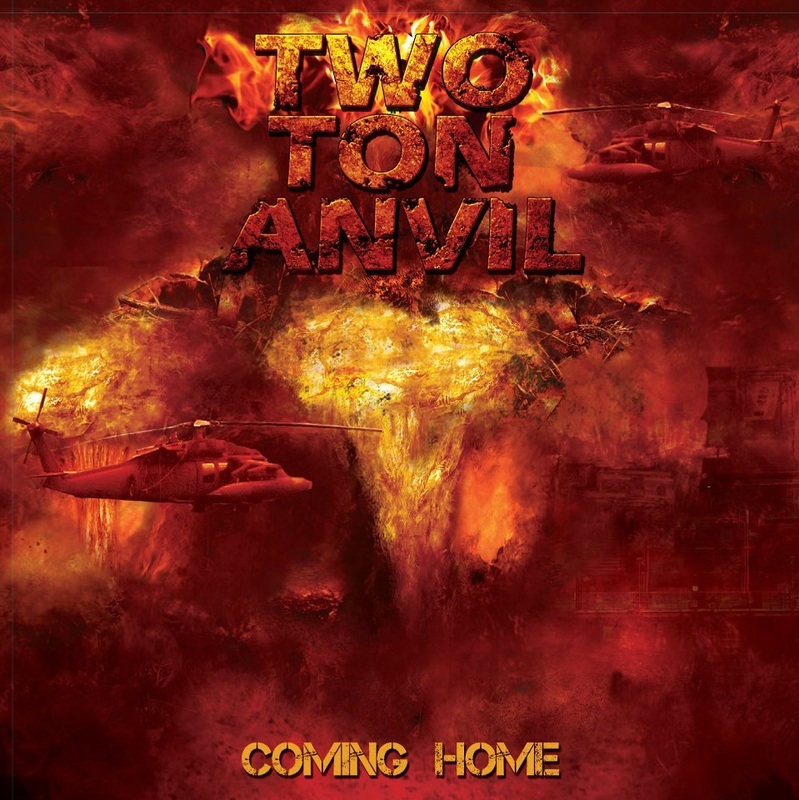 Two Ton Anvil would like to announce and congratulate Torrey M. & Austin K., from the Chicago NW 'burbs, the winners of our 'Name The Album' contest. They had the most clever, and in-line with our thoughts, suggestion for the new album's name. 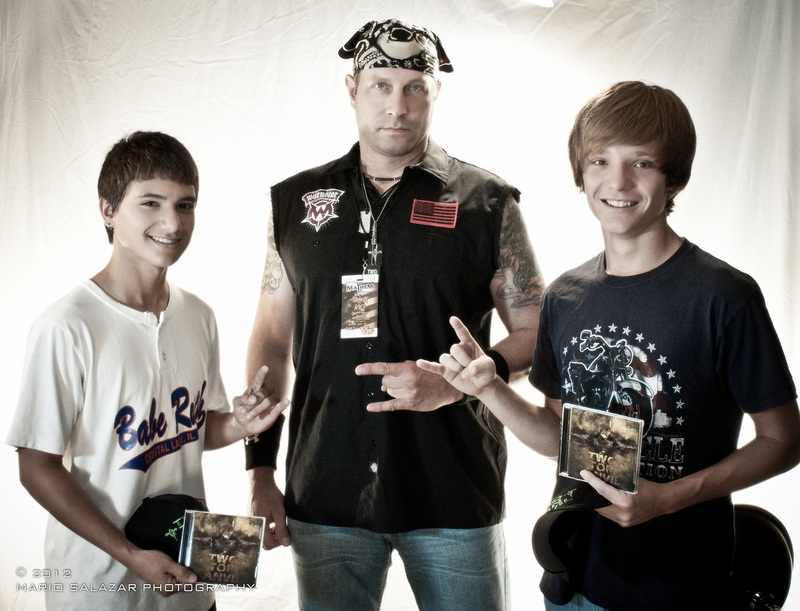 They're seen here picking up their brand-new, autographed copies of 'Coming Home'. They've also received a variety of merchandise items including t-shirts, dog tags & posters as part of the winning prize. 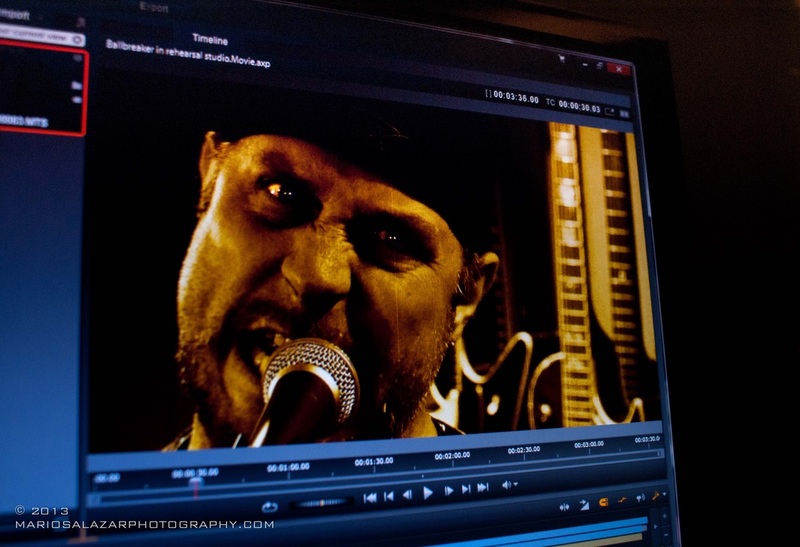 In addition they will the opportunity to have a cameo on the band's next video which we hope will happen in 2013. Congrats Torrey and Austin from TTA! $8 @ door! Doors @ 6pm - All ages Showtime is 7pm! $7/advance $10/door Doors @ 6pm - 21+ Showtime is 9 PM! MORE SHOWS TO BE ADDED SOON! Live at Krew rock Lounge! $10 Doors @ 6pm - Pre St Patty party @ 7 PM! $10! Doors @ 6pm - 21+ Showtime is 8 PM! $7 Doors @ 6pm - 21+ Showtime is 9PM! No cover! Doors @ 6pm - 21+ Showtime is 8 PM! $8 cover 21+ Showtime is 8 PM! 2 Stages! Showtime is 8 PM! End of Summer Bash-Two Ton Anvil outside! Check out this National booking club! Showtime is 8 PM! Halloween Bash Show! Showtime is 8 PM! 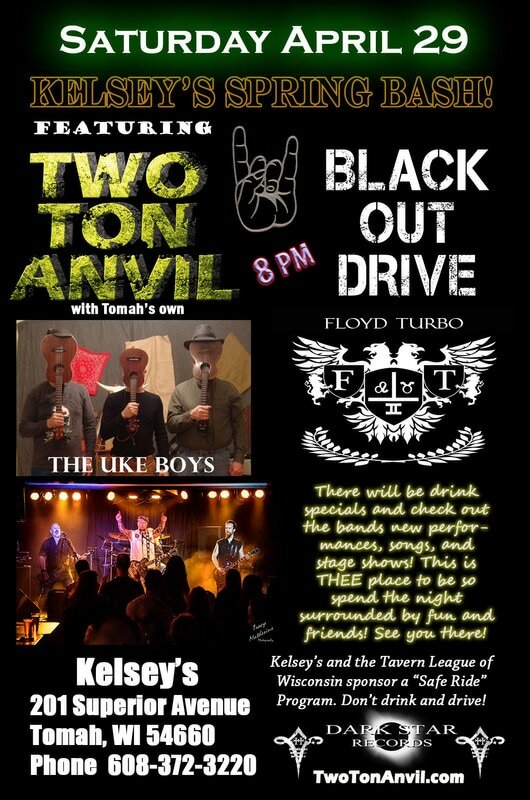 BLACKOUT Drive and special guests FLOYD TURBO! Costume party - drink specials - THEE place to be! $10! Doors @ 7pm - All Ages! Showtime is 8 PM! $7! Doors @ 6pm - 21+ Showtime is 9 PM! 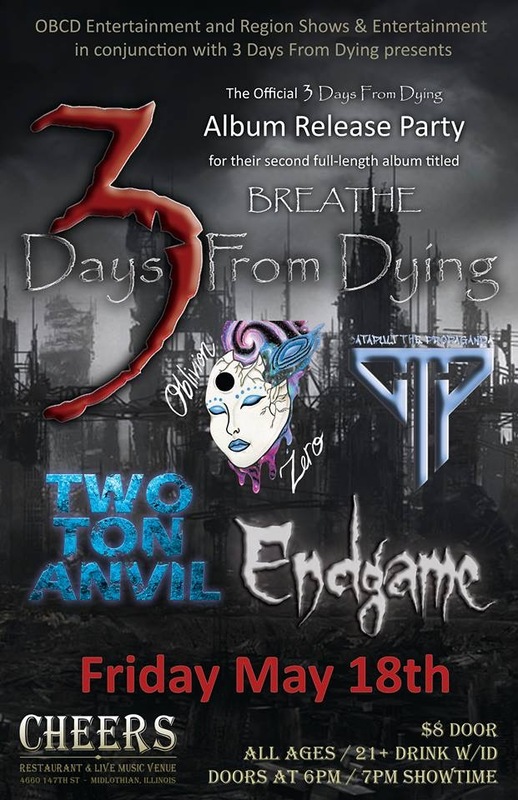 Praise the Fallen, Emissary Echo, Bareknuckle Bullseye, & Dead Horse Trauma - ROAD TO THE REVIAL KICKOFF PARTY! $10! Doors @ 2pm - All Ages! Showtime is 3:30 PM! we're generating all new songs - thanx for your support! This website is best viewed with the latest version of your preferred browser and it has been optimized for use/viewing on mobile devices. All music in this website is by Two Ton Anvil and that along with all of its content, is protected by U.S. and International Copyright Laws. © Two Ton Anvil, Schaumburg, IL. All Rights Reserved. Website Maintained & Administered by Mario Salazar.